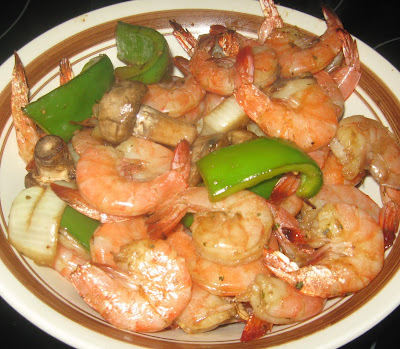 We had grilled shrimp again tonight, and YES we had shrimp wok grilled last week as well. I've had a sinus and double ear infections, and frankly the guys are lucky they are getting food at all around here. I feel dreadful. Shrimp in the grill wok is super simple though and easier than going and picking up something to eat. No. We do not have delivery out here in the country. Sigh that. I did decide to fancy things up a bit with our grilled shrimp, since this is two weeks in a row. So, I used Melanie Yunk's Big Acres Teriyaki & Ginger marinade on this batch of vegetables and shrimp. Melanie's marinade gave the grilled shrimp and veggies a richer and fuller flavor without adding any extra work on my end. 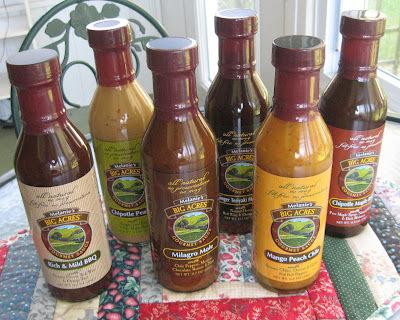 Her Big Acres gourmet marinades and sauces are top notch, and I recommend them and also note that her collection that you see above is a real cool gift for friends or family who are foodies or ones who just don't know what they are missing. 1. First I fire up the grill. This can be a charcoal, gas or electric grill. I used a gas grill tonight. The temperature should be fairly hot - around 375 degrees F or close. 2. I spray the grill wok with non-stick spray to make clean up easier. Tonight, I used Weber's grill non-stick spray. I think it's new. I've not seen it until lately here, and it works great. Then I let the grill wok heat a bit. 3. I have my vegetables in marinade. In this case, it was Melanie's Gourmet Teriyaki and Ginger. I also use Kraft Zesty Italian or I use olive oil and add my own seasonings. 4. I put my vegetables in the grill wok for about 5 minutes to give them a little head start, unless my shrimp are large. Mostly, around here, the shrimp sold are medium. 5. Once the vegetables grill for a few minutes, I add the shrimp to the grill wok. 6. I stir now and then and watch the color. My grilled shrimp took about 10 minutes, but that can vary on the heat and size of the shrimp. The main thing is to get the shrimp the pretty orange cooked color. That means they are done. And, if you keep cooking them, they get rubbery. Just watch the color. That's the key. When they look done, they are done. Well, that was my quick and easy grilled dinner tonight. It took 15 minutes total on the grilling (not including the heating times). We ate the food like a Low Country Boil - just picked up shrimp and veggies (green peppers and mushrooms) and had lots of paper towels. This same meal can be served over a rice bed for a more upscale meal, but I did not feel like doing rice tonight. I did boil some corn on the cob and made some canned biscuits to go with our wok grilled shrimp. Again - going easy on the dinner when not feeling great. There were sure no complaints. The guys grabbed plates of the wok grilled shrimp and vegetables and watched the ballgame on TV. They did the dishes too, so I call this a really good dinner night and sure super easy. I have a message for the webmaster/admin here at barbequemaster.blogspot.com. Can I use part of the information from your post right above if I give a backlink back to your site? Hi Jack - Email me at cyndiallison at gmail dot com. Although not a big shrimp fan, this looks like something my family and I would enjoy, just to change things up a bit I may give it a whirl one day soon. Those Sauces look great to, I have heard a lot of great things about Melanie's Sauces. Weber's spray is excellent. It is one of the only ones I have found that won't flash over when sprayed over open flame. Even Pam's High Temp version still ignites. Wow, rather cool information. Where will I find this RSS?